How to take care of your cat properly, here’s 5 great tips! Having a pet has many advantages and can help you develop a rewarding relationship with one or more animals, but they depend on you for grooming, feeding and taking care of them. Cats are among the most popular pets, and because they are rather independent, taking care of them is not too hard, especially if you take into consideration the following tips. Cats are very adventurous and like to explore new places so keeping them safe is up to you. Most people keep their cats indoors to protect them, and also provide indoor cats with a litter box. If you want to let them enjoy the outdoors as well, you can do that by walking them on a leash, as this is the best solution for the cat and for yourself. However, it’s easy for a cat to slip out the door when you are not careful, so make sure that your pet has a collar with your name, number and address on it. Grooming and playing with your cat are also important activities that help you bond, so you should make time for these activities as often as you can. Since food and water are essential for any pet, your cat should have access to fresh, clean water and benefit from a balanced diet. Your veterinarian can help you choose the right type of food and tell you how to feed your cat. 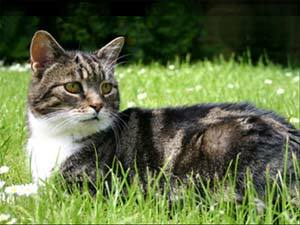 Medical care is another essential step when it comes to taking good care of your cat. Your veterinarian can also help you with vaccinations and regular check-ups. Your vet may also advise you to spay or neuter the animal to prevent potential health issues. A litter box is another necessary item for the comfort of your cat. All you have to do is place the litter box in a quiet, private spot, show your cat where it is and it will instinctively use it. Don’t force the cat to use the box, as this is something that happens naturally. Make sure that your cat has easy access to the box and avoid placing it near heating or noisy machines. Food and water should also be far from the litter box, or the cat may not use it. Keep the litter tray clean by scooping it at least once a day and wash it from time to time with hot water and liquid soap. If your house has more levels, make sure to keep a litter box on each floor. If you have two or more cats, provide multiple litter boxes placed in different spots, so that each cat will have its privacy when needed. You can also place the litter box in your bathroom, but don’t forget to leave the door open at all times. Have more great tips to share on the proper care of a cat? Sign up on Pet Talk where you can join in conversations about your cats or any other animals… and share your stories! Over the past month, I have been thinking about getting a kitten. I liked that you pointed out that it would be smart to make sure that give it clean water often. It might be smart for me to ask a vet about what foods are best for kittens. The big problem with the cat is they get very aggressive with each other in my place. cats are very friendly and emotional animal. we need all require thing said on this article. Spending some of your personal time is most important for cats. It builds emotional connect and trusts. Having 2 cats in the past and one right I feel very special that I had and have such nice companions.